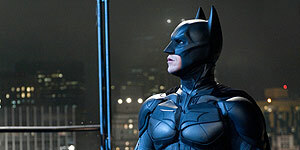 I really enjoyed the Dark Knight Rises, the plot was interesting and well played out. Christian Bale was again good as batman, though his ridiculous batman voice did start to grate after a while equally as did Tom Hardys Ban voice. Anne Hathaway was a treat as Catwomen. It's a shame that this is the last in the series of Nolans batman films! It was indeed an "epic conclusion", but only in so much as the grandiose photography, large scenes, many extras (not quite the scale of Lord of the Rings, but you get my drift) and equally epic special effects ... But, it just seemed to drag a little in places and felt a bit slow and, to be honest, I forgot I was watching a Batman movie at some points! All in all – it was good, but I agree, not the grand finale we were hoping for. It did leave us with some promise for the future though. Not bad and quite enjoyable - but at least 30 minutes too long. Some crumbs of emotion and characterisation in between near constant guns and explosions. Yawn! Hardy is fun as the villain psychopath, if inevitably eclipsed by the incomparable Joker from the second movie in the trilogy. Hathaway is a svelte and lovely Catwoman. The rather wonderful Joseph Gordon-Levitt looks set to re-boot the franchise all over again with the scene set for a new trilogy. Is this what the cinema audience really needs?